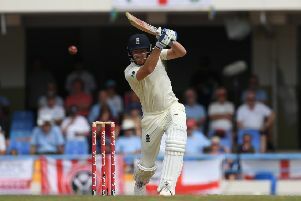 Jonny Bairstow admitted England found the pitch in Antigua difficult to play on after another chastening day against the West Indies. The Yorkshireman was England’s second-highest scorer with 52 on a day when only four batsmen got into double figures after the tourists fell for 187. West Indies closed on 30-0 for as they look to build on last week’s emphatic first-Test win in Antigua. 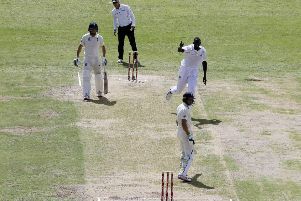 “It was tough, you could see the variable bounce that we had to contend with,” said Bairstow. “They put the ball in good areas and made us make decisions on a pitch that was probably bowler friendly, especially in the first couple of sessions this morning. “There are two different grass types on it. On the outside where the balls were bouncing from, there’s either a ridge there or there’s something to do with the grass. There’s a few variables with that but you have to counter-act them. When you come in at six and seven you are against an older ball. Coming in at three you have guys that are fresh with a new ball in their hand potentially, in their first spells on a pitch that is fresh. “I don’t think you felt in because you always knew there was a ball in there that could bounce or keep low. “Especially when they have three guys (bowling) there that are well over six foot. It is just a case of understanding the situation when you come in. Bairstow believes England’s bowlers can strike back on day two, adding: “We bowled extremely well tonight. I thought we were unlucky not to get a few nicks. “The indecision that has been coming has been coming from that length that is slightly less full.